It’s been a little while since I’ve posted. 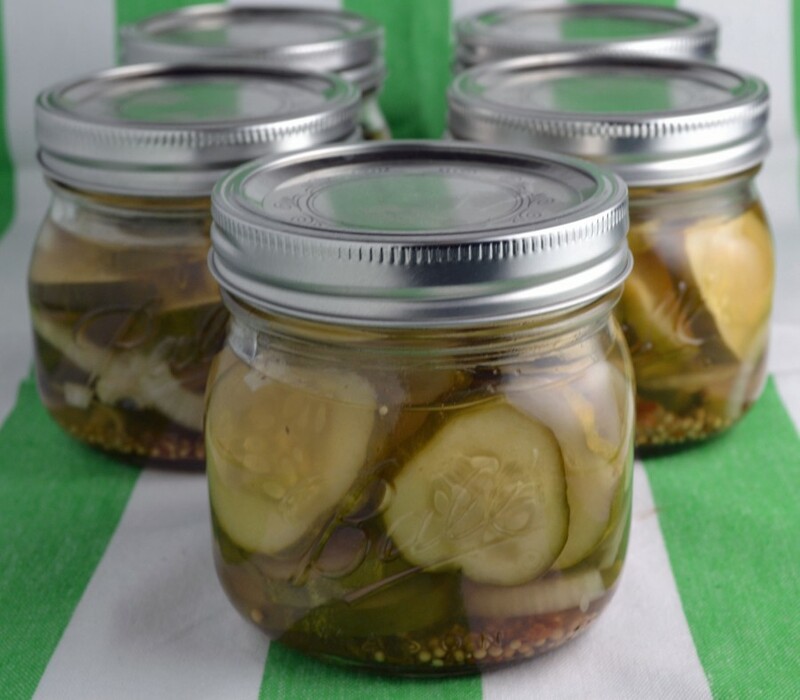 Returning from my summer hiatus, it may seem strange that I selected a pickle recipe – but I absolutely love pickles. And apparently, I’m not the only one. They seem to be growing in popularity and I continue to see more and more specialty pickles at regular grocery stores. The basic dill and bread n butter pickles still remain the staples but now there are garlic dill, horseradish dill, spicy dill, half sour, and sour, just to name a few. There are also different and trendy, often hipster like brands that specialize in..well…specialty pickles. They are delicious but usually expensive, often charging $8-$9 for a small jar. This is why making homemade pickles seems so well worth it. Not only can you add and adjust the spices to your liking, but with just a few ingredients, you can make enough pickles for a year, at less than half the price. I made quite a few modifications to this recipe, originally from “The Art of Good Cooking.” Most notably, I eliminated the whole cup of olive oil my grandmother instructed to use. I find that vinegar and water works perfectly fine and is both healthier and less expensive. I also added sprigs of dill and adjusted some of the spices. The actual process of making the pickles is very basic and despite what some may believe, no special canning equipment is needed. Just a big pot and canning jars are sufficient. The most important part of the process is salting and chilling the sliced cucumbers and onions. This seems to help ensure a crunchy pickle, which in my opinion, is the key to a good pickle. I’m not a fan of the soft ones, with little or no resistance when you bite into them. The crunchier, the better. A crisp crunchy pickle is a reminder of the fresh cucumber it was made from. That tasty tang from the brine and vinegar makes it the perfect add on to any end of summer barbecue dish – especially hamburgers! 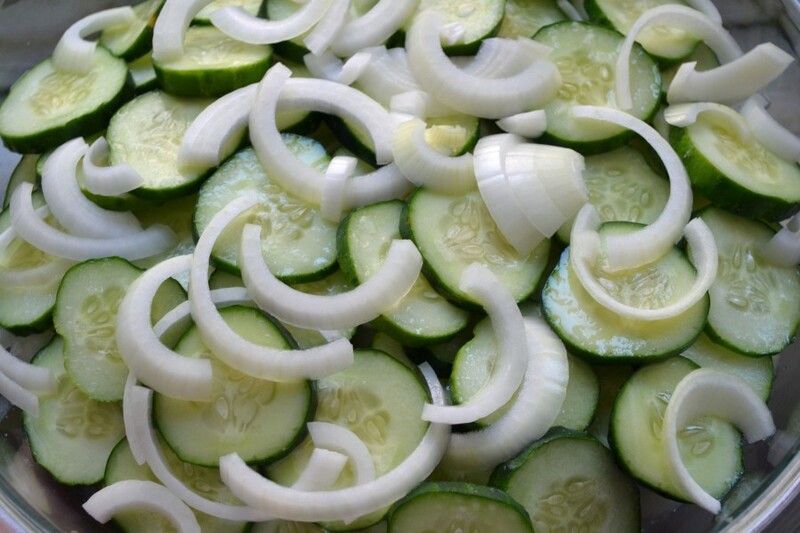 In a large bowl, make alternate layers of sliced cucumbers, salt, and sliced onions. Let stand in refrigerator 5 hours. Rinse in ice water and drain well, pressing out as much liquid as possible. Return vegetables to bowl. Place a clove of garlic, a sprig of dill, and a bay leaf in each jar. Pack jars with vegetables. Pour cider vinegar and water into a pot. Add sugar, mustard seeds, pickling spices, and celery seeds. Bring to a rolling boil. Pour mixture into each jar to cover vegetables. Cover tightly. Store in the refrigerator for two weeks or to make pickles shelf stable, place jars in a canner or pot of boiling water for 5-10 minutes or until the lid does not move up or down when pressed in the center. Note: To sterilize jars and lids, simply boil them in a large pot of water for 5 minutes.